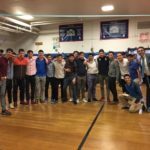 MTA talmidim celebrated Yom Ha’atzmaut with an exciting array of activities. The celebrations for Israel’s 70th Birthday began with the entire yeshiva davening an uplifting Hallel together at Shacharis, followed by Rosh Yeshiva Rabbi Michael Taubes reinforcing the importance of the day with a meaningful d’var Torah, and a lively chagiga with singing, dancing, and a kumzits. Talmidim were also privileged to hear from MTA alum and former administrator Rabbi Ellis Bloch (‘66), who made aliyah and is currently an Educational Consultant for the Jewish Education Project. Rabbi Bloch discussed the historical significance of Eretz Yisrael and how it ties in to the tefillah of Hallel. Talmidim, rebbeim, and faculty enjoyed the opportunity to bond together and strengthen both their relationships with each other and their love for Israel.